Apple this weekend updated its regional online stores to reflect improvements in iPhone X availability, which is now shipping in as few as one to three days in some locations. According to Apple's website, U.S. orders for all iPhone X models attached to AT&T, Sprint and Verizon networks, as well as SIM-free versions, deliver in 3 to 5 days, a marked improvement over recent ship-by estimates. Shipments of T-Mobile iPhone X units are pegged at nine days. Lead times are even better in some international markets including Canada and China, which both show estimated delivery dates of 1 to 3 business days. European availability is akin to that of the U.S., with ship times in Germany and the UK pegged at 3 to 5 days, and France at nine days. In-store pickup availability is also greatly improved from last week, with Apple outlets in major metropolitan areas like Los Angeles, Chicago, New York, Pittsburgh and Seattle showing the device as available to buy on Monday. The stock updates are in line with expectations from KGI analyst Ming-Chi Kuo, who in a note to investors late last month said supply chain improvements were to thank for boosted retail channel density. Specifically, Apple reportedly diversified LCP LTE antenna orders to a second manufacturer, while producers worked out production bottlenecks related to the dot projector used in iPhone X's TrueDepth camera system, a highly sophisticated and sensitive component that powers exclusive features like Face ID. With parts now rolling in at a steady pace, Kuo believes Apple assembly partner Foxconn is pumping out between 450,000 to 550,000 iPhone X units per day, up from an estimated 50,000 to 150,000 units. Apple last updated iPhone X shipping estimates at the end of November, when U.S. deliveries fell below one week for the first time since the device went up for preorder in October. Pent up demand for a fully redesigned flagship iPhone led to a quick sellout of Apple's limited iPhone X launch supply, which was exhausted just ten minutes after preorders went live. Consumer interest in the device continued, pushing back ship-by times to well over one month. 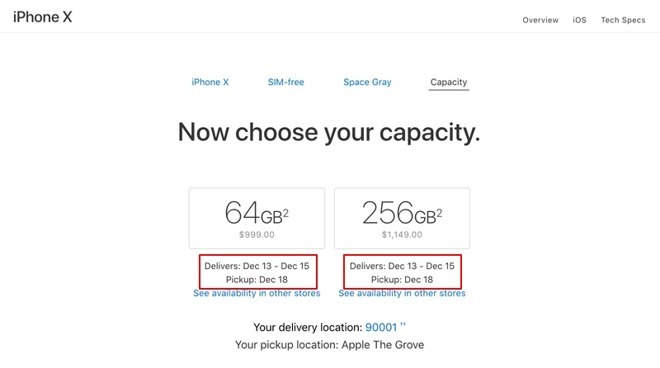 Within hours, iPhone X delivery estimates hit a high of 5 to 6 weeks.